With quarterback Drew Stanton suffering through a knee injury, the Cardinals have added some reinforcement at the position. 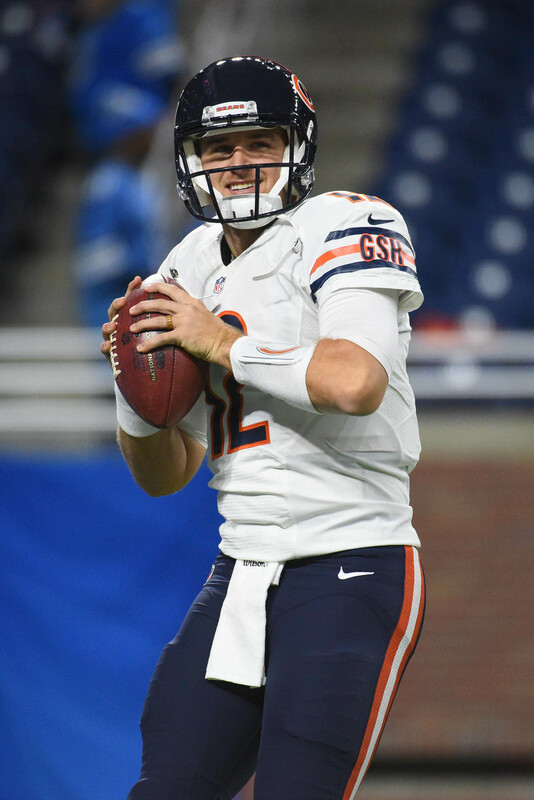 The Cardinals announced this evening that they have signed quarterback Matt Barkley. The team has also promoted safety Harlan Miller from the practice squad. To make room on the roster, the team has placed safety Tyvon Branch, offensive tackle D.J. Humphries and tight end Ifeanyi Momah on injured reserve. We learned last week that Stanton had suffered a sprained knee during Thursday’s loss to the Seahawks, and there were reports that the team could turn to Barkley for a backup role. A former fourth-round pick, Barkley played in seven games (six starts) for the Bears last season, completing 59.7-percent of his passes for 1,611 yards, eight touchdowns, and 14 interceptions. The 27-year-old inked a two-year deal with the 49ers during the offseason, but he was released at the end of the preseason. Barkley also had a stint with Arizona between 2015 and 2016. Assuming Stanton, who was filling in for the injured Carson Palmer, misses time, Blaine Gabbert will get the first shot at the starting gig. The 28-year-old appeared in six games (five starts) for the 49ers in 2016, completing 56.9-percent of his passes for 925 yards, five touchdowns, and six interceptions. He’s yet to appear in a game this season. We learned earlier this week that Branch, Humphries, and Momah were likely to miss the rest of the season. Branch suffered a torn ACL during Thursday’s contest, and considering his impending free agency, his injury-filled tenure with the Cardinals could be over. Humphries dislocated his kneecap and suffered MCL damage on Thursday night, ending the third-year edge blocker’s season prematuraly. Momah, a former undrafted free agent out of Boston College, injured his knee against the Seahawks. Miller, a 2016 sixth-round pick, started two games for Arizona as a rookie, compiling seven tackles and one interception. He was waived by the organization in early September but ultimately landed on the team’s taxi squad. The Packers have reached an injury settlement with safety Chris Banjo, who was on injured reserve with a hamstring injury, tweets Michael Cohen of the Milwaukee Journal Sentinel. Banjo, who had appeared in 37 games with Green Bay, becomes the second Packer to be released from IR in the past week, joining wide receiver Jared Abbrederis. The Browns waived tight end Connor Hamlett, according to Aaron Wilson of the Houston Chronicle (Twitter link). Hamlett appeared in three games after being promoted from the practice squad earlier this month. Tight end Ifeanyi Momah suffered a broken wrist on Sunday and will be waived by the Cardinals with an injury settlement, per Kent Somers of AZCentral.com (Twitter link). Momah, an undrafted free agent in 2012, was seeing the first NFL action of his career. The Cardinals will release defensive lineman Red Bryant, reports Josina Anderson of ESPN (on Twitter). The 32-year-old Bryant, who was previously a starter in Seattle and Jacksonville, played sparingly in six games with the Cardinals last season. The club brought him back on a one-year deal in March, but he wasn’t able to crack its roster. Arizona will also cut receiver Brittan Golden, per Ian Rapoport of NFL.com (Twitter link), and waive/injured pass rusher Tristan Okpalaugo, according to his agent, Brett Tessler (Twitter link). Today’s round of minor transactions around the NFL is dominated by exclusive-rights free agents. ERFAs are players with less than three years of NFL experience, who don’t have a contract for 2016. While these players are technically considered free agents, they don’t have any real freedom when it comes to picking their destinations — if their current teams want them back, all those clubs have to do is submit an ERFA tender (typically worth the minimum salary), which precludes those players from negotiating with any other teams. The Bears have tendered a contract offer to ERFA wide receiver Josh Bellamy, according to Brad Biggs of the Chicago Tribune. Bellamy saw a decent amount of playing time on offense, catching 19 passes for 224 yards and a pair of touchdowns, and was also one of the club’s top contributors on special teams. The Cardinals have assigned ERFA tenders to defensive tackle Josh Mauro and tight end Ifeanyi Momah, signaling that they want to bring back those players, the team announced today on its website. Momah missed the 2015 campaign with a knee injury, while Mauro was a depth piece on Arizona’s defensive line. The Titans have re-signed ERFA running back Antonio Andrews, the club announced in a press release. The move is classified as a re-signing rather than a simple contract tender because Andrews has already signed the offer. He figures to compete for a roster spot in Tennessee in 2016. The Buccaneers have assigned an ERFA tender to long snapper Andrew DePaola, agent Sean Stellato tells Ian Rapoport of NFL.com (Twitter link). DePaola has been Tampa Bay’s full-time long snapper since the start of the 2014 season. 1:05pm: The Cardinals have officially signed Fauria and moved Momah to their IR, according to Darren Urban of AZCardinals.com. 8:59am: Several days after he was let go by the Lions, Joseph Fauria has found a new NFL home, according to Ian Rapoport of NFL.com, who reports (via Twitter) that the tight end has agreed to a deal with the Cardinals. Fauria paid a visit to the team yesterday. For the Cardinals, the addition of Fauria comes on the heels of news that tight end Ifeanyi Momah suffered a torn meniscus and will undergo surgery, which will land him on the injured reserve list. When Arizona makes the Fauria signing official, placing Momah on the IR figures to be the corresponding move for the club. Fauria, undrafted out of UCLA in 2013, has compiled 24 catches for 281 yards and eight touchdowns during his career. Last year, a late-season ankle injury landed the 25-year-old on the injured reserve. This year, he became expendable in Detroit when the Lions picked up Tim Wright in a preseason trade with the Buccaneers, pushing Fauria further down a depth chart that also features Eric Ebron and Brandon Pettigrew. In Arizona, Fauria will compete for a playing time at tight end with Darren Fells, Jermaine Gresham, and Troy Niklas. Cardinals tight end Ifeanyi Momah suffered a torn meniscus and will undergo surgery tomorrow, sources tell Mike Garafolo of FOX Sports (on Twitter). Momah will subsequently be placed on IR, ending his season before it could start, Ian Rapoport of NFL.com tweets. It’s a sad piece of news for Momah, who came from out of nowhere to win one of the Cardinals’ starting tight end jobs this offseason. The converted wide receiver first hooked on with Arizona after a tryout and he made the most of his opportunity. Now, he’ll have to wait another year to try and make his NFL mark. With Momah out, the Cardinals are probably hoping that Jermaine Gresham can get himself ready for significant usage early in the season. They could also go out-of-house for another tight end. Joseph Fauria is among the notable names now available at the position.